Apple iPhones and, more conspicuously, Apple iPads captured the first address of the new pope, Pope Francis, as he appeared on the balcony of St. Peter’s Basilica more than an hour after white smoke was released from the Sistine Chapel chimney at 2:05pm EDT (7:05pm CET) to signal that a new pope had been selected. 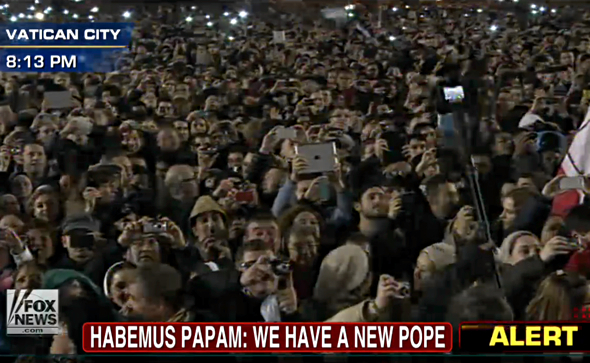 Along with hundreds of iPhones, multiple iPads and iPad minis were held up by members of the huge crowd in order to capture the proceedings in Vatican City. These crowds are making it rather tough to get to my genius bar appointment the Apple Store Vatican. You know, I just realized You are on the ceiling of the Sistine Chapel. As an agnostic, I give a hale and hearty yawn. As to the Apple connection, the new Catholic Bishop of Rome is widely reported to have concerned himself with economic inequality in his prior gig in Buenos Aires. I doubt he will be standing in line at the Apple Store Rome for the next iteration of iPhone or iPad. So he is a Liberal Pope….? There was nothing in that description indicative of the Pope’s political ideology. However for him to be concerned with growing economic inequality around he world, it does indicate that he’s a warm-blooded human being, unlike the people convening at CPAC tomorrow. For the first time in the conference’s history, a Latino, Senator Ted Cruz of Texas, will deliver the keynote address at CPAC. The conference’s opening speaker this year will be Sen. Marco Rubio of Florida. Despite what some fscking ignoramuses believe or want other low-info dullards to believe, both are human beings and indeed, warm-blooded. Nice, hot Latino blood, in fact. No nationality has cornered the market on stupid yet. dunno, I can think of one Canadian. If you would admit the cause of most ‘economic inequalities’, you would understand the irony of my statement. Instead, it drew a knee-jerk….. Some help with that affliction. Maybe he can heal it…..
Obviously not a low information voter, just an idiot! Obama doesn’t care about economic distress so what does that make him? A cold blooded Socialist? Hey, if Hell has a golf course and no whining Liberals, Obama is up on that! HUD estimated that there were 250,000-350,000 homeless on a typical night in December 1983-January 1984. This compares with an estimated 636,000 homeless in 2011, the figures heading into the fourth year of Obama’s presidency. Interestingly, if not predictably, the media, comedians, and Hollywood have gone completely silent about the homeless. Why isn’t the media and Hollywood talking about the homeless under the charlatan Obama? Why aren’t liberals or “progressives” or whatever they’re calling themselves today in order to confuse the low-information voters? Do they suddenly no longer care about the homeless? Or are the homeless merely a convenient political tool, to be ignored or exploited depending on whose party is in power? In all fairness, the recession preceding Reagan’s term was nothing compared to the depression that started when Obama took office. Far more people were made homeless by the recent one, especially since it actually hit directly at home ownership, so your parallels seem a bit disingenuous. One should also take into account the population growth as well; in the early 80’s, those homeless represented somewhere around 1.4% of the total US population. Today, they represent about 2%. The difference is obviously still significant, but not as great as it looks when absolute numbers are compared. And the discrepancy in the coverage where Reagan was castigated over the homeless, yet Obama plays golf to the sounds of silence? In all fairness, Reagan inherited a mess (several, actually) that Carter created and then took it on and fixed it. Obama inherited a mess created by the Democrats under Clinton and allowed to fester under Bush (OK, that just sounds nasty…..). Problem is, after 4 years, he has only made a bad situation worse. There IS a big difference, percent of population aside. The homeless numbers will continue to increase as businesses try to cope with new taxes and regulations. If anything has been ‘sequestered’ under this administration/congress, it is our economy…..
BTW, over a third of the greater # of homeless now is simply covered by the large increase in population in the U.S. (assuming the same homeless percentage). Actually, the point isn’t the numbers, unless you are just trying to obfuscate, the point is the discrepancy in reaction from the media, comedians, and Hollywood: Feigned outrage for political benefit in the 1980s vs. Pure silence for political benefit today. As soon as a Republican takes the White House, comedians will be onstage whining about “the plight of the homelesss” and collecting donations, Hollywood films and TV movies will again feature homeless themes, and CBS “news,” etc. will routinely feature stories about the homeless. Reagan cut funding for mental health services dramatically, and those cuts resulted in thousands of mentally ill people winding up on the streets. The reason he was blamed was because his administration was responsible for cutting away the safety net for a group of people who were barely hanging on to begin with. He won’t have to… Like Moses parting the Red Sea, Pope Francis will part the masses of humanity found perusing the Apple store. He has someone to do that for him. Or he uses mail oder. Another 1000 year of oppression in all its forms. Yes, the world would be so much better off without religion. Never mind the thousands of day-to-day goodness that comes from most of them in the way of charity or encouraging love, we need only focus on the 10% that results in all the worlds calamities….normally by people who hijack a religion and haven’t a moral bone in them. Yes….let’s focus like a laser on THEM!!! BTW, CitiX….I’ll bet you my bottom dollar there is a woman from the past in your family that was fairly religious who showed you what goodness of heart meant, yet you can write that person off as ‘simple minded’….? Actually my mother had all the hallmarks of a Saint without the miracle part. I agree that there is much day to day goodness from people who also happen to be religious. I would bet the amount of day to day goodness wouldn’t drop off all that much if the hierarchy of the church disappeared today. I was talking about the pope and that whole institution that perpetuates so many wrong attitudes and beliefs. I never said anything about simple minded people. Don’t these people have something better to do with their lives? And would they if he had used an android device? Just because you do not understand something that you’re obviously not a part of, do not attempt to denigrate it. The only thing you denigrate is yourself. sherm66, your masochism knows no bounds. Due to the belief of papal infallibility and that the pope has the power to change the Ten Commandments, esp. the 4th one, they’re cheering because God has just been elected. Doesn’t change the fact that the papacy believed that by claiming Peter as the first pope, according to Scripture, that gave them the power to change laws that Peter and the Jews would never have considered changing, aka. the 4th Commandment. And many Protestant denominations still recognize the power of the papacy by worshipping on Sunday.